Raising the bar for cameraphone quality is one thing, but Samsung's 8-megapixel camera-packing i8510 also combines high-grade imaging work with a top-table set of features that put it firmly among the best in class. The Samsung i8510 is the most ably equipped Samsung phone we've yet seen. It doesn't do touchscreen control, but it has a rollcall of high-end functionality that ticks off many of the latest must-have features. 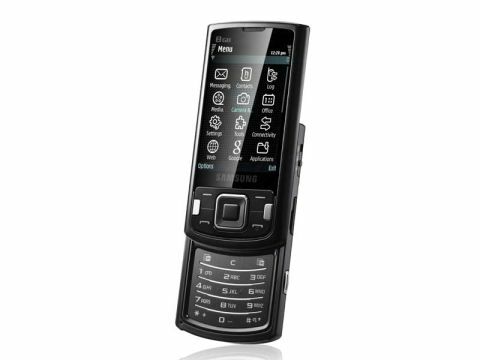 Like Nokia's Nseries lineup, this is a powerfully-built Symbian S60 smartphone. It's an HSDPA-enabled 3G handset, offering mobile data rates of up to 7.2Mbps, and complements this high-speed mobile connectivity with Wi-Fi support. Satellite navigation is facilitated by A-GPS (Assisted Global Positioning System) technology inside. Its extensive multimedia facilities – including music and video player – are backed up by large onboard storage capacity too; the phone comes in both 8GB and 16GB versions, while high capacity MicroSDHC cards up to 16GB can be used in the handset. Samsung also makes use of the S60's smartphone flexibility by stuffing in a decent selection of additional web-based applications, including a package of Google features including Google Maps, a Fring VoIP and IM client, plus content sharing and social networking apps like Shozu and GyPSii. On top of its S60 smartphone functionality, the Samsung i8510 gives a design nod to the N95 8GB, with similarly chunky bodywork and a larger than average screen. The phone's 2.8inch QVGA (240x320 pixels) 16 million-colour display provides good screen real estate for inspecting images, viewing video and browsing the web. It has a motion sensor built in, automatically tilting the display between portrait and landscape as the phone's orientation is switched. The casing measures a stocky 106.5(h) x 53.9(w) x 17.2(d)mm, and it weighs a substantial 136g – it's no slimline phone, but does have a great build quality about it. Samsung's implementation of the S60 user interface differs slightly from the Nokia set-up on the home screen, but it soon falls into line as you enter the menu structure; Nokia Nseries phone users will soon feel familiar playing with this device. The i8510's home screen has a column of function icons (shortcuts, calendar, music player, FM radio and personalisation option) ranged down the left side, and as you scroll down further sub-menu options appear in the main part of the screen. The shortcuts menu provides fast-tracking into a list of key useful functions. Although the i8510 has a powerful set of features, its handy to have these so easy to access. Tap into any of these, or press the main menu buttons, and you're taken into a conventional Symbian phone environment of extensive menus with multiple options. The control panel under the display is based around a navigation D-pad, with twin softkeys, call and end buttons, plus chrome main menu and gallery keys. Although this is mostly standard S60 stuff, the central navigation select button also doubles up as touch sensitive trackpad. This enables you to swiftly scroll through menu lists and across web pages using fingertip control. It's a neat idea, and works well in places. It takes a bit of getting used to, but can be useful for some apps like the browser. Whether you'll want to use it much or switch it off will depend on individual preference. Some users might find it too sensitive (although this is adjustable), and it's possible to accidentally flip the cursor and select something you didn't mean too. But we'd recommend giving it a good try before deciding whether it works for you. There's no dual-slider like Nokia's N95 design, but the numberpad used on the i8510 is excellent – it's chunky, but there's bags of room and keys are well defined for responsive to the touch tapping. On the side of the phone, Samsung has included a welcome 3.5mm headphone socket, so you can upgrade to your own standard-headphones should you wish to. As it is, the supplied set are very good for a mobile in-box set, with a selection of changeable silicone tips so you can get a tight in-ear fit – sound quality is significantly better than most mobile phone buds. The camera is certain to be the key feature for many potential i8510 buyers. The 8-megapixel shooter's lens is protected by an automatic internal sliding cover that flips open or shut when the camera's active. A switch on the side slides between camera, video or playback mode - a user-friendly standalone camera-like touch – and there's a typical camera button in place. The camera-like back panel of the phone sports a dual-LED flash rather than a more powerful and precise xenon option, so low-light shooting isn't the finest possible quality. Samsung doesn't go for the big-name lens-maker endorsements, or include a optical zoom like its camera-centric G800. Nonetheless, the i8510 is capable of producing top quality pictures with stunning levels of detail and excellent colour rendition. The autofocus system is narrowly centred so you can get some great, sharply focused compositions; there's an effective macro mode for close ups too, while a blink detector setting is included to cut down on blink-ruined shots. Which seems to work most times. Anti-shake and Wide Dynamic Range shooting aids are included as well, to counteract hand wobble and difficult lighting conditions. Shot processing is speedy and efficient, with no shutter lag issues, and the interface is not overcomplicated,. There are a rich array of settings controls to optimise your imaging or adding effects. Multi-shot options include an excellent panorama shooter that uses the motion sensor and onscreen frames to help stitch together continuous shots. Shame it's in low-res VGA quality only. The 8-megapixel image sensor should enable you to print high quality images well above standard photo print sizes, should you wish to, but even on a PC screen you'll notice the fine level of detail you can get with this camera. We found the overall imaging performance among the best we've yet seen from a cameraphone. Moving images are dealt with pretty well too, shooting at maximum VGA (640x480 pixels) resolution, plus the option to shoot at 120 frames per second so images can be played back in smooth slow motion. Both still images and video can be uploaded to a wide range of popular websites, blogs and content sharing services – including YouTube, Facebook, Flickr and many more - thanks to the Shozu application that's preloaded. Video playback is enhanced by DivX video support, and full screen video playback using the RealPlayer app on the 2.8-inch panel is impressive. You can, of course, copy over video files as well as music to this phone from a PC, as well as downloading or streaming clips over the air (using HSDPA or Wi-Fi). Video calling is also supported – there's a secondary camera for face-to-face calls sitting just above the display. Plenty of room is available for loading up video or music content. With that iPhone-like 8GB or 16GB storage, plus optional MicroSD card expansion up to 16GB, the i8510 has massive potential as a music and multimedia phone. The decent quality performance of the music player backs this up; it sounds very pleasant through the supplied earphones, nicely balanced with a good range and depth of sound. It has a typically straightforward to use S60 user interface, with tracks categorised into familiar lists, and music player controls operated by the D-pad. It does its job very well indeed. A-GPS is another welcome bit of technology crammed in to the i8510. Although it does have Route 66 Sat Nav software pre-loaded, it's not set up for out of the box satellite navigation – you first have to activate the package by subscribing to the service. You can use the useful Google Maps app to get spot-on positioning, route-planning, satellite views plus location-based searching for services points of interest and addresses. We found that the A-GPS didn't establish positioning with satellites quite as quickly as on the latest Nokia Sat Nav-enabled phones we've tested, but once it got a fix it held on solidly enough. The A-GPS technology can be used with additional applications. Photos can be 'geotagged' with positioning metadata, so you can view where they were taken on an onscreen map, while the pre-loaded GyPSii social networking app can incorporate location data into real time friend-finding, geotagged image swapping, and so on. Web-based applications are well catered for, thanks to Wi-Fi and high-speed HSDPA mobile data connectivity. The S60 browser used here puts in a good performance, rendering pages quickly and efficiently, with a variety of page views and pan and zoom options. It's similar to a Nokia Nseries browser, and supports Flash for a more convincing web experience. Web feeds can also be stored, while the phone's trackpad control makes scanning through pages quick and mouse-like. In addition to uploading and social networking services like Shozu and GyPSii, the i8510 has a good selection of other web-based apps onboard. A Google folder inclues Google Mail and Search apps to go with Google Maps, while the Yahoo! Go mobile application is pre-loaded – bringing together a number of services, from email to news updates and location services to weather reports, in one application as a kind of alternative widget-alike home page. The pre-loaded Fring application enables cheap VoIP internet voice calling and instant messaging over a range of popular services, using Wi-Fi or mobile data connections. Samsung's been generous with its spread of pre-loaded third-party applications, and as the i8510 is an S60 smartphone users can easily add more to customise it. Samsung has also included push email, plus a plentiful supply of regular organiser applications – including calendar, notes, convertor, clock functions, calculator and dictionary. Adobe PDF and Quickoffice document viewers are included too, although editing documents requires an optional software upgrade. A couple of decent 3D Java games are included too – FIFA 08 and the Asphalt 3 Street Rules motor racing game. Not forgetting that voice calling is still an important feature of any multimedia-driven mobile device, the i8510 checks in with a top class performance. Calls are clear, with high quality audio delivery. Battery performance though is obviously going to be issue with any handset boasting so much high-end gadgetry. It's difficult to judge exactly how well it will perform for you, as individual usage will vary so much, depending on how much the more power-hungry features (like GPS, Wi-Fi, video playback and so on) are used. Simply, the more juice-sapping features you use, the more often you'll have to charge it. We found ourselves charging the phone every couple of days with our normal usage, but we occasionally had to charge daily if we used certain features heavily. Samsung estimates that the i8510 can provide talktime of up to 5 hours in 3G coverage or 8.5 hours on other mobile networks, while it can run on standby for up to 330 hours. It's not just the 8-megapixel camera that's impressive on this device – Samsung has put together a smartphone that's packed with functionality and is well geared up take on Nokia's current crop of Nseries handsets. With stacks of internal storage, a great set of features and a top-class performance, this is the finest mobile phone we've yet seen from Samsung. Highly recommended.